Seeded Oatmeal Wheat Bread is on the drawing board today. 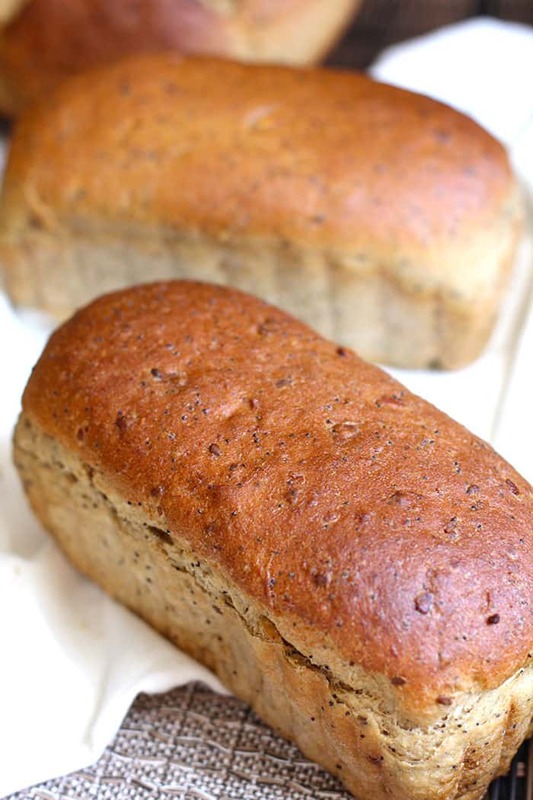 A hearty, nutty tasting bread, made with oatmeal, honey, white whole wheat flour, and plenty of seeds! Baking bread is a lot like art. It is a process that starts with yeast, liquid, flour, and salt – and possibly several other ingredients, depending on the type of bread you are making. The ingredients are transformed during the proofing process and completed in the oven. The end product is a beautiful loaf of bread. And if you do it right, it’s delicious as well. I believe my Mom was an artist in the kitchen. Baking bread was her creative outlet. And it has become mine too. However, while my mom shared her art by giving bread away, I get to complete the process by sharing it with all of you. Because I believe art should be shared. 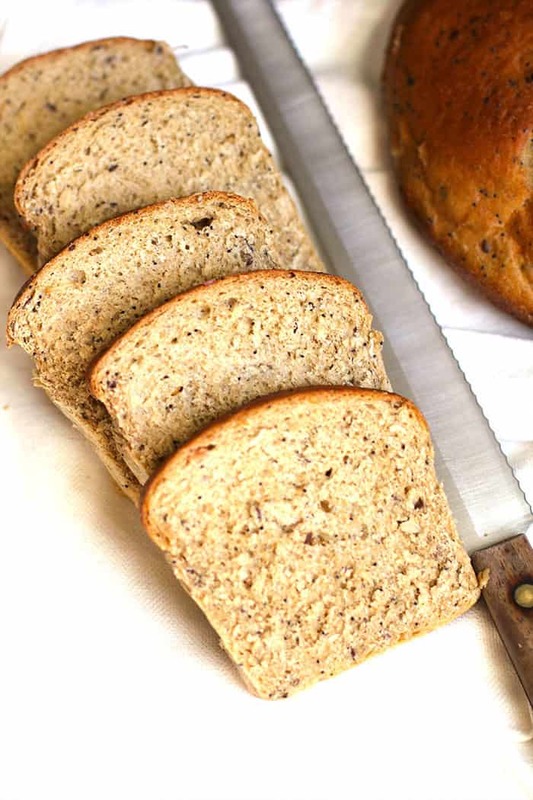 Some tips for making epic Seeded Oatmeal Wheat Bread. You can also change up the seeds, and use whatever you have on hand. My inspiration for this recipe. My sister, Jackie, introduced me to Whole Foods’ Seeduction Bread during our visits to see her family in Colorado. Ever since, I’ve been thinking about making a copycat version. So this Seeded Oatmeal Wheat Bread is my attempt at making a seedy bread, similar to Seeduction. I didn’t mimic the ingredients exactly, but I made sure to use plenty of seeds and white whole-wheat flour. I used chia seeds, poppy seeds, flax seeds, and pumpkin seeds. And the result was GREAT. Maybe not exactly like Whole Foods, but definitely grainy, nutty, and seed-y. White whole-wheat Flour has the same nutritional value as whole-wheat flour but is made from a different grain of wheat. It has a milder taste and a paler color. It also has a nuttier flavor than regular all-purpose flour, but not as nutty as 100% whole-wheat. 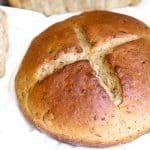 I love how this bread turned out using white whole-wheat flour. Whenever I bake, I make several loafs so I can 1) give some away, 2) freeze some (for a Texas blizzard..haha! ), and 3) feed my bread loving family. My Bosch mixer makes it super easy to make multiple loafs fairly quickly. I like to experiment with different sizes and shapes, and I even used my cast iron skillet this go-around. 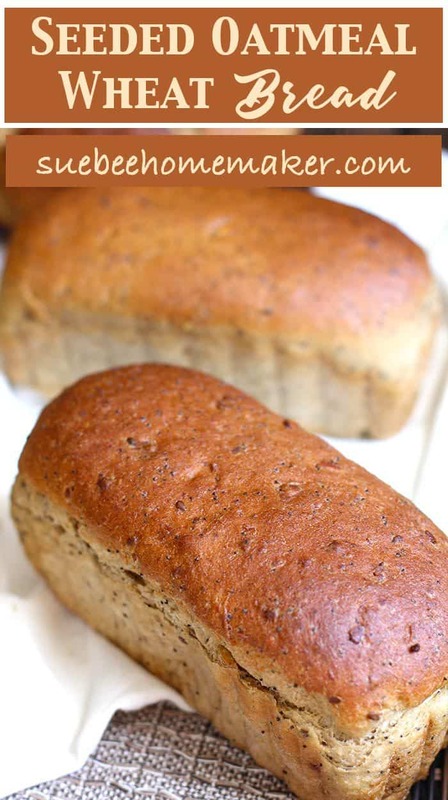 A hearty, nutty tasting bread, made with oatmeal, honey, white whole wheat flour, and plenty of seeds! Prepare the yeast mixture. Combine the yeast and warm water in a large standing mixer. Be careful to use WARM water, not hot. If the water is too hot, the yeast will disappear and you can't make bread without yeast. Mix and let sit for about 15 minutes to get the yeast working. Add the honey, oil, salt, and cold water. Stir with a spatula. Attach dough hook to mixer and add the oats, chia seeds, poppyseed, flax seeds, and pumpkin seeds. Start the mixer and mix until fully combined. Then add approximately 5 cups of flour. Start mixer and let the flour absorb. Then gradually add more flour, a little bit at a time until dough is less sticky and pulls away from the sides of the mixer. You want the bread dough to be slightly sticky but not too much. When you touch the dough, it should bounce back slightly. Be sure to leave the mixer on for several minutes after you get the right consistency. Grease a large bowl with canola oil. Add dough to the bowl, making sure you smooth it into a ball, by punching it down - starting in the center of the dough. Place dough with smooth side up and cover with a clean towel. Let the dough (approximately) double in size. Punch down the dough again - by pushing down with your fists in the middle of the dough, pulling the outer edges in towards the middle. Re-grease the bowl with oil and place the dough with smooth side up. Let rise until doubled in size again. Form dough into shapes for loaf pans, or any pan shape you desire. Use same punch down method for each leaf, making sure smooth side is facing up. Let loaves rise again until doubled in size. Bake loafs on 350 degrees for approximately 30 minutes, or until bottom is nicely browned. Remove from pans to wire racks and brush tops with butter. Cool completely before storing in storage/freezer bags. 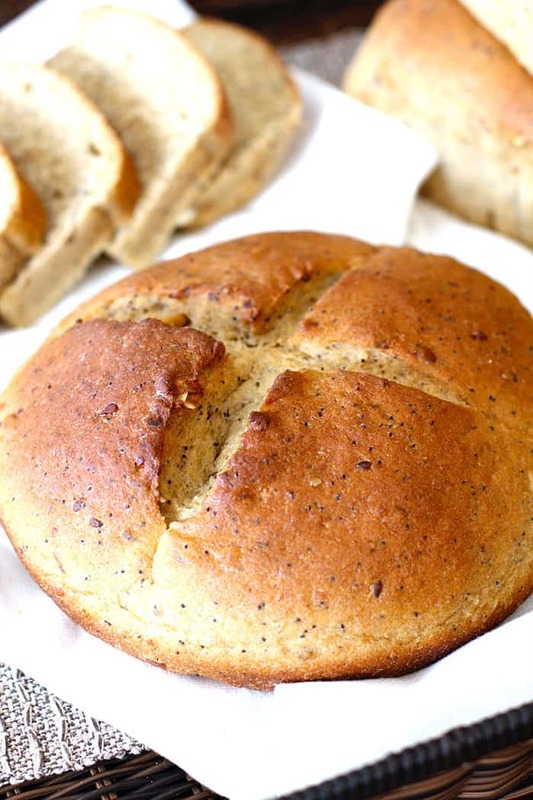 This bread freezes well for up to three months. Use freezer bags and seal tightly. Best bread! Will make again and again. I love your bread recipes! You have something special going with them!